(Nanowerk News) Physicists at Penn State University have performed the first laboratory experiment with a system of many colliding particles whose motion never becomes chaotic. The achievement provides a deeper understanding of conditions that govern the boundary between order and chaos in physical systems. The research also has the potential to improve the accuracy of modern communication and navigation systems, which rely on high-precision gyroscopes or force sensors. 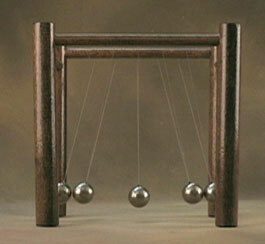 The research, titled "A quantum Newton's cradle" has been published in the April 13, 2006 issue of the journal Nature. "A fascinating thing about this system is the remarkable stability of its momentum profile, which does not change even after each atom in the system has collided thousands of times," says Professor of Physics David Weiss, leader of the research team. Unlike every-day experiences with colliding atoms – for example, a small heater that eventually warms the air in an entire room – Weiss's system does not reach the state physicists call thermal equilibrium, even after a long time. "We are not really making time stand still in our system – but it does look that way," Weiss says. Weiss explains that his team has constructed a system that is integrable, meaning that it can be described by equations of motion that predict its future when the equations are solved in one direction, and its past when they are solved in the opposite direction. "Only a handfull of integrable many-body systems are known, and this is the first time that any of them has been observed experimentally," Weiss says. Now that such systems can be studied experimentally, the researchers hope to discover more about the factors that tip a complex system into chaos. 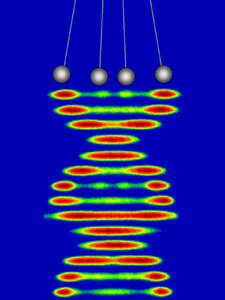 Weiss's group, which includes postdoctoral scholar Toshiya Kinoshita and graduate student Trevor Wenger, began the experiment by first constructing what they call a "Quantum Newton's Cradle," the atomic equivalent of the mesmerizing toy that has five steel balls suspended from strings arranged in a straight line. The toy is fascinating because, when a ball on one end is pulled to the side and released to swing to a collision with the other balls, the ball on the opposite end swings out but all the other balls remain in place. "Such striking behavior, where the momentum values do not change even though momentum is exchanged among the balls, occurs only in one dimension – a straight line. Collisions between particles in two or three dimensions quickly result in the familiar homogenized state of thermal equilibrium," Weiss explains. "We built the Quantum Neuton's Cradle in order to answer the question: Does a 1-dimensional system of particles ever reach thermal equilibrium?," Weiss said. The device uses interfering beams of laser light to form an array of thousands of parallel, tube-shaped traps that force atoms to stay in one dimension. "Quantum mechanics ensures that the motion within each tube is strictly one-dimensional," Weiss explains. The researchers then loaded into each tube about 150 atoms that were chilled to extremely low temperatures, just billionths of a degree above absolute zero. Other laser beams set the trapped atoms in motion in one dimension, making half of them go to the right and half to the left. Each group then oscillates in the trap, colliding with the other group twice each cycle. "The quantum Newton's cradle is just like a classical Newton's cradle, except that it's more perfectly one dimensional and instead of 5 balls there are hundreds," says Weiss. "Also, because it's a quantum system, the atoms often just go right through each other, which never happens with the executive desk toy. Another difference is that you can't buy the quantum Newton's cradle on the Internet." "We set all the atoms oscillating in the trap with almost the same amplitude. We found that even after each atom has bounced off the other atoms 10,000 times, each still oscillates with the original amplitude," Weiss says. "By shutting off equilibration," Weiss says, "we can use 1-dimensional gases to gain insight into how equilibration occurs. Now that we've seen them not equilibrate, we are looking at what we need to do to make them equilibrate. Theory has guided experiment up to now, but experiments are now in a position to guide the theory. It's a fine example of the way scientific progress is made." Potential applications of the Penn State experiments involve devices important to modern communication and navigation systems that sometimes can be limited in their accuracy by collisions among atoms. "Trapped atoms also can be used as precise force sensors, which can be limited in their sensitivity by collisions," Weiss adds. "Strict 1-dimensional trapping might completely suppress the harmful effects of collisions and significantly improve the precision of these devices."